We don’t usually frequent CAs this well known, and so close to city centres. However, in my efforts to provide our readers with some easier to “get to” and “get around in” walks for the Winter season, we recently took a visit to Lynde Shores. We’d been here once before, but not in a reviewing capacity. It would appear we either missed a few trails back then, or they created a few more since we were there last. The “getting to” is simple enough. From the 401, take Brock St South to Victoria St. 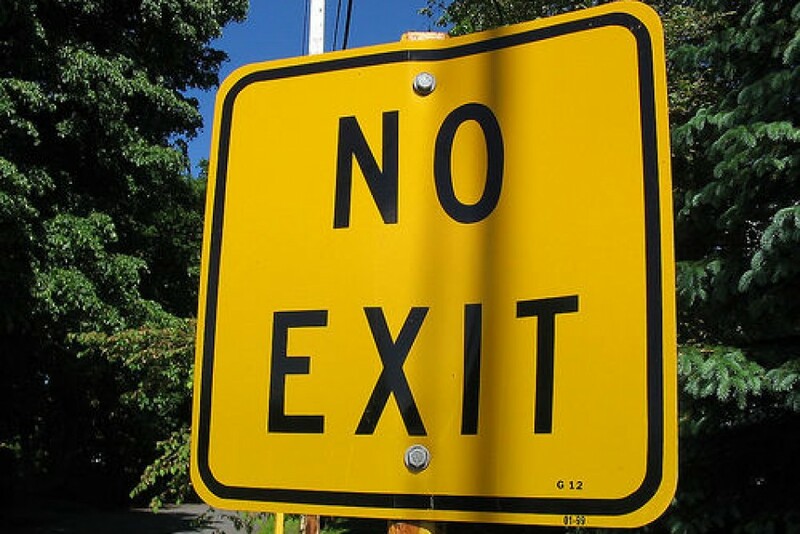 Turn right, and the entrance is about 2.5 kms on your left. There’s another way in from Hall’s road (from the Waterfront Trail), but you’ll be parking on the roadside. Otherwise, the trails are level and well trodden. The “Waterfront Trail” wanders through this CA. In it’s transit, some of the CA trails use it to connect to each other and it makes up parts of them as well. Please note, dogs aren’t allowed on any trails but the Waterfront trail ($75.00 fine) which pretty much makes bringing a dog, not a good idea (sorry Kevin). There are two significant wetlands here and it’s feared that dogs would upset the wildlife. On the subject of wildlife, let me tell you this … at less than 5.5 kms from Ajax’s city hall and less than 8 kms from Whitby’s city hall, I have never had such wildlife experiences, as we did here. Never. Anywhere. From the parking lot kiosk, there are picnic facilities to your left and a short boardwalk jutting out into the marsh. This trail skirts the edge of a meadow. A meadow that was once a cultivated field, as evidenced by our discovery of an abandoned barn foundation and silo. However, before we saw them, we stopped to hand feed a coupla chickadees as we knew this CA is famous for them from a visit about five years back. While standing there feeding them (and an unusually bold gray squirrel), the Wife spotted some deer back in the bush. We stood perfectly still as they wandered toward the open trail. I stood poised with camera in hand, hoping to get (at best) a headshot of the 1st one before it saw me standing there. I triumphantly snapped a shot as she stuck her head out, and then, this happened. All the pictures in the .GIF above were taken without the camera’s zoom function. She actually got so close that I became a bit nervous. You don’t realize how big those things are until there’s one standing there looking you straight in the eyes. Eventually, she lost interest and wandered off into the meadow, nibbling on dead plant heads sticking out of the snow. Then the other three bounded out of the bush, over the trail, and wandered off after the 1st one. They continued grazing about forty feet away as we carried on with our walk. As we came to the “Private Road” we saw the Lake Ontario trail heading off to the South. This one is not as popular in the Winter as the other trails. It was some tougher sloughing, but we appreciated it all the same. It basically follows the Private Road down to the lake where a lovely view and an equally lovely bench were available. We climbed down to the beach to see if we could walk the beach to the other, (solid pink) trail on the map near Halls Rd. Maybe you could do it in the Summer, but I could see a coupla fallen trees that would be difficult to crawl under in Winter. There’s a short path (across the road) from the Lake Ontario Trail that takes you to a viewing platform for the Cranberry Marsh. It’s labelled “Nature Viewing Area” (in brown) on the trail map. This was the trail we remembered from years before. We were thrilled at that time by hand feeding chickadees which has become rather commonplace to us these days. But this time … as if the deer encounter wasn’t enough … this time, this trail blew me away ! As we walked it, I could hear voices and saw two red jackets through the trees ahead. Then I saw something milling about on the ground in front of them. We rounded a curve in the trail to see two people surrounded by a whole rafter of wild turkeys ! The turkeys were totally unafraid of us and seemed to have no intention of clearing the path. I was gingerly stepping around them when I heard the Wife make a sound. I turned to see her being mobbed by a dozen 30 lb, three and a half foot tall birds. She still had a handfull of peanuts we’d been feeding to the chickadees, and the turkeys knew it. Of course, my camera battery crapped – out just before this. I so dearly wanted to drop kick it into orbit, but I needed the SD card with the deer shots on it. We chatted with the couple for awhile until there was a terrific gobbler fight or something back in the bush and the turkeys ran off to see what it was all about. We continued on toward the parking lot where we encountered yet another rafter of turkeys and a school busload of kids. We had a great laugh as three young hens came racing down the trail to join the others. They looked like tubby road runners. As we stood, waiting for the kids to clear out, a huge male Hairy woodpecker landed on my hand and took a peanut ! Males of this species, just don’t do that. I should warn you here, not to feed the turkeys. Numerous signs instruct visitors to feed only songbirds. The reason became obvious to me when I compared the size of the turkeys to the children from the school bus. They’re very large birds, and those were very small kids. Besides we saw a guy feeding turkeys by hand and apparently, they’re not real gentle about it. We returned ten days later (with a fully charged camera battery) and the turkeys were still all over the place. The woodpecker landed on the Wife’s hand this time. You can walk the Waterfront Trail from the LeVay’s Trail across a meadow and down Hall’s Rd to the Bobolink Trail, the Raptor Viewing lookout, and another Lakeshore access trail. However that’s almost 2 kms walking (one way) with over half of it being Hall’s Rd. just to get to less than a kilometer of trails. We elected to walk the whole thing from the LeVay’s Lane Trail to the Bobolink trail. In all honesty folks, I wouldn’t even bother to drive it, much less walk it again. Down Hall’s Rd. there are two more lookouts over the same marsh that you already saw from the Victoria St. side. There’s another short walk to Lake Ontario, which you saw from the Victoria St side. Finally, the Bobolink trail is very short, and does little more than loop around a handful of trees. I mean, since you’re there anyway, you could certainly take a quick cruise down Hall’s Rd. But the walk is all paved and not real interesting. There is no charge parking on the Hall’s Rd. lots if the $5.00 charge at Victoria St. is that much of a deal-breaker. The trails here are all quite level and wide so it doesn’t matter which direction you start from. The ample parking at the Victoria St. entrance is at a cost of $2.00/hour, or $5.00 for the whole day. Access from Hall’s Rd is free. There are picnic facilities and permanent washroom facilities at the Victoria St. parking area (though the washroom facilities are locked up in the Winter). A pier juts out into the marsh near the picnic area as well. Should be quite pleasant in the Summer months. There are plenty of rest benches on all the trails as well. Dogs are allowed only on the Waterfront trail, which basically goes from Hall’s Rd, across an uninteresting cultivated field through a very short section of Lynde Shores, to Victoria St. So it really does just “cut through” the CA without traversing anything interesting. The LeVay’s Lane Trail is the longest loop trail (1.8 kms) where deer can be sighted. The shorter loop (500 m) Chickadee Trail is where you’ll be able to hand feed numerous species of birds (and chipmunks in their season). These beasts along with ducks, Canada geese, and wild turkeys, will greet you the instant you hit the Chickadee trail. All other trails are one-way returns. 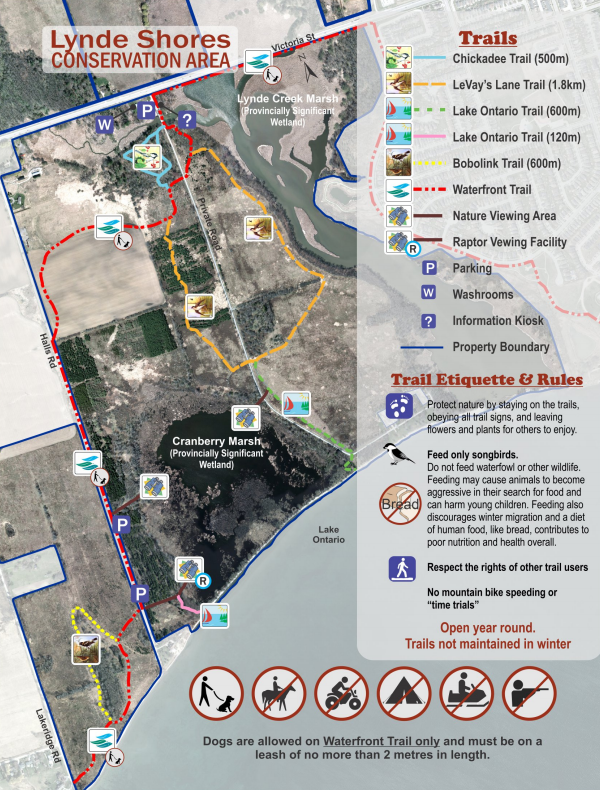 The Hall’s Rd Trails are just two more viewing platforms of the Cranberry Marsh, a short walk to Lake Ontario, and an uninteresting short walk around a patch of trees near the lakeshore.